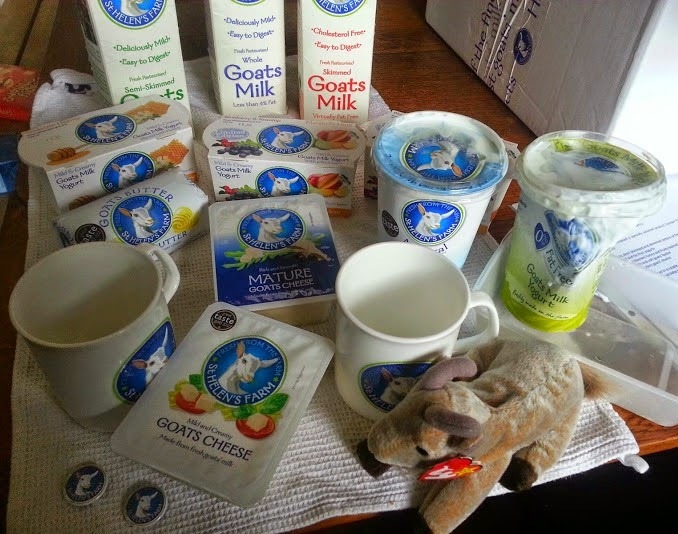 Recently St. Helen's Farm sent me a fantastic chilled gift hamper full of their range of goat's milk products. 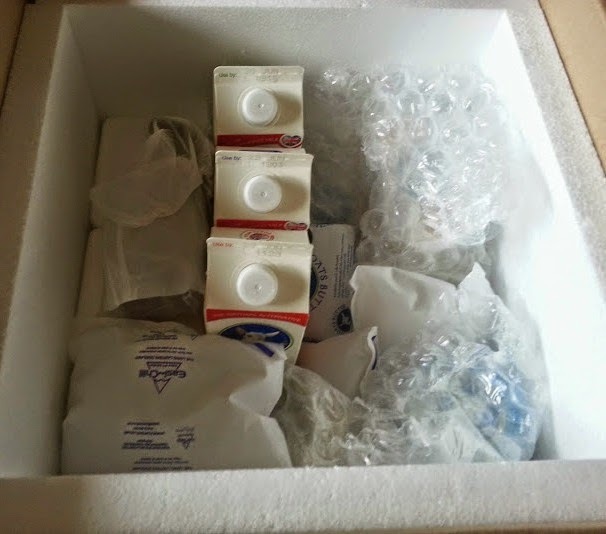 Goat's milk and butter, cheeses and several yogurts, my family were delighted with it. The only things missing from their full range were their double cream and the ice cream - which sadly can't be sent by post! Goat's milk contains less allergenic proteins and lactose than Cow's milk, and some people with an intolerance to cow's milk, or who feel uncomfortable after drinking it, feel their symptoms are improved by replacing it with goat's milk. 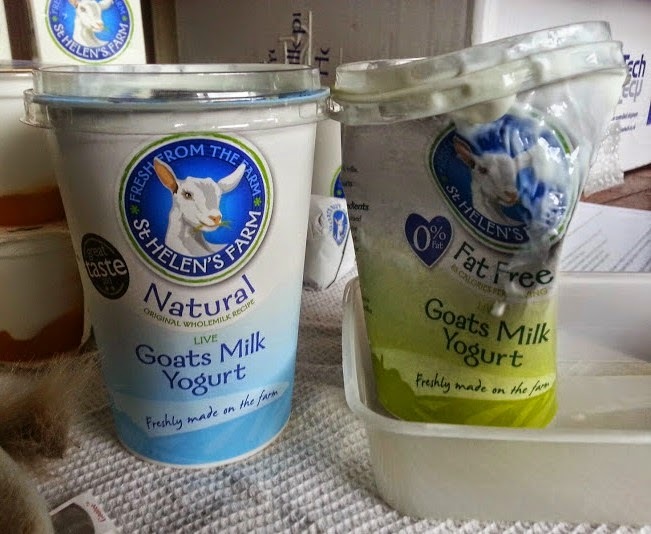 Any health benefits aside, my partner's family bred goats when he was little, and goat's milk holds a very dear place in his heart, so he was delighted to be doing this review. The hamper was beautifully packed, I even took a photo because I was so impressed. Sadly this didn't stop one of the yogurts getting crushed, and another popping it's lid. I definitely put this down to unfortunate. The box must have just been bumped in exactly the wrong place, you couldn't do it again however hard you tried. 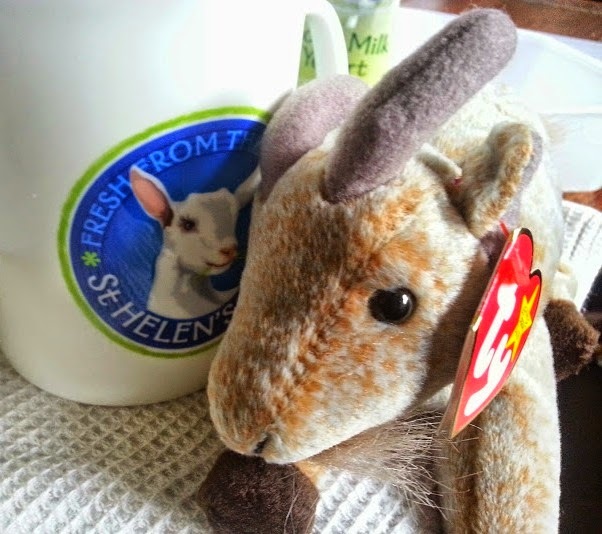 Goatee the Goat guarding my St Helen's Farm mug. 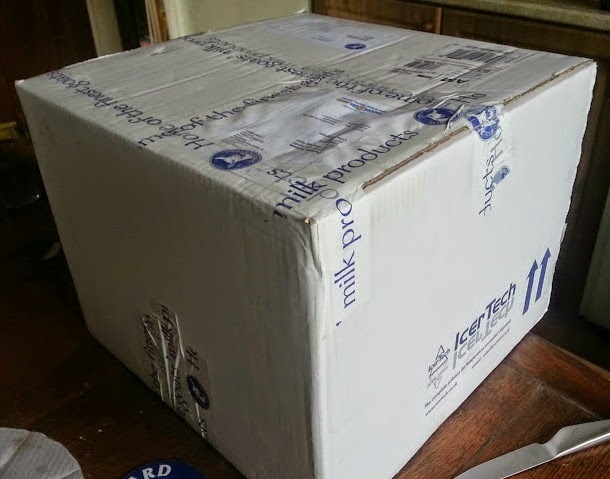 Despite the incident which had befallen them, there was still enough Natural Yogurt left to test, and St Helen's Farm actually sent me vouchers to get some more Fat Free Yogurt. My 5 year old especially loved the Natural Yogurt, he says it's his "favourite flavour of yogurt". 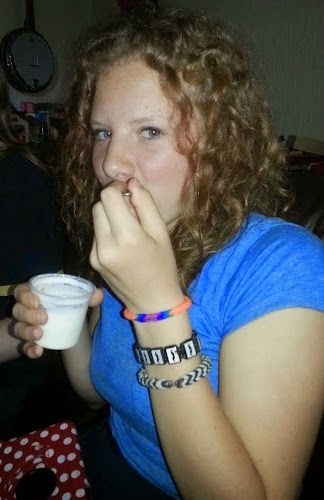 It was runnier than we're used to nowadays with set yogurts, but every bit as creamy with a really rich taste. The Fat Free Yogurt was also deemed a hit, but not quite so popular, retaining the flavour, but not quite the richness (as to be expected really). 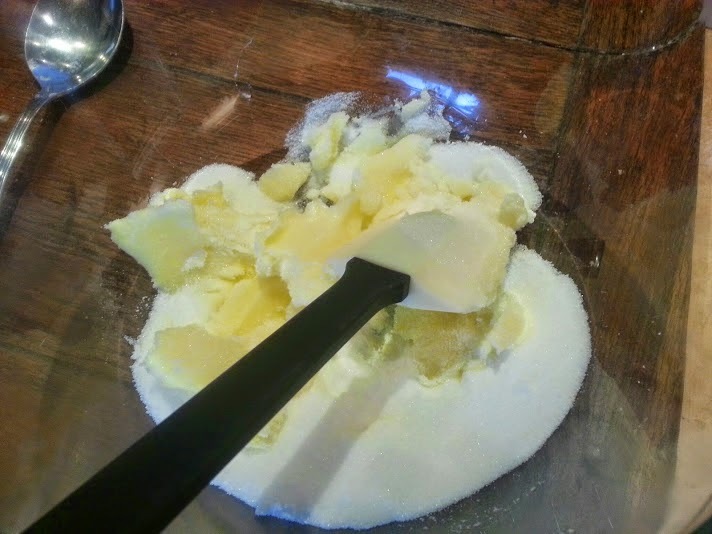 I actually love the fact this is a pat of butter with a proper shape. It's quirky and special nowadays. The taste is lovely. Proper butter which isn't too salty, and has a somehow slightly tangy flavour, as opposed to being completely creamy in taste. 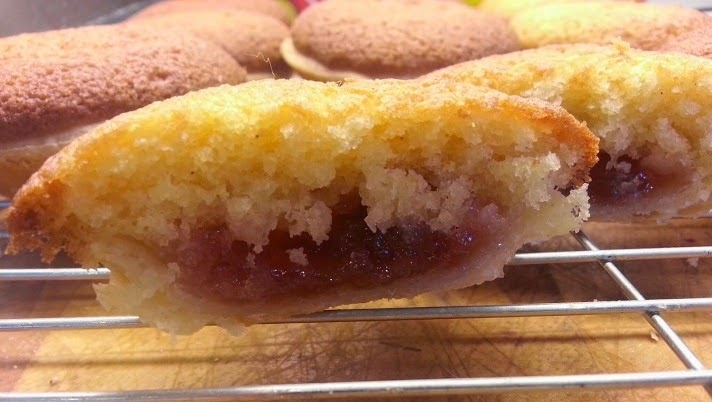 I used most of the butter in my Duerr's Jam Sponge Tart mix, along with some of the Goat's Milk. Using the milk in coffee and tea I didn't taste any difference to cow's milk with all 3 varieties (skimmed, semi-skimmed and full fat). I personally don't like it so much as a drink though. My partner loves it, and my children all drank it without even seeing a difference. I feel it tastes a little sour, but I have very little sense of smell, so sometimes I do taste things differently. 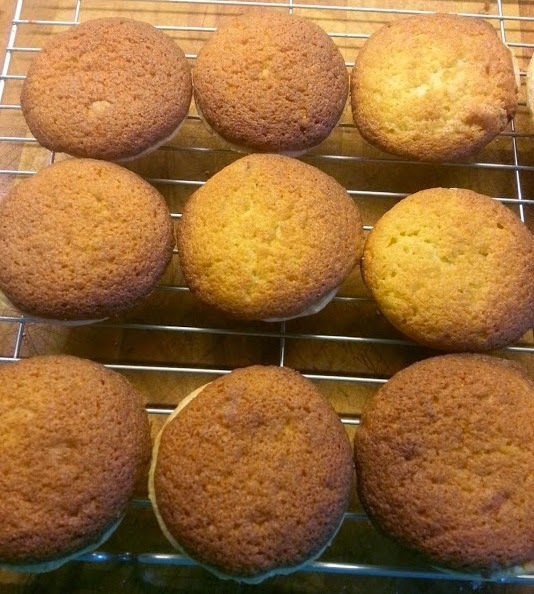 Both the milk and butter behaved in baking exactly as I'd expect, and the tarts tasted excellent. 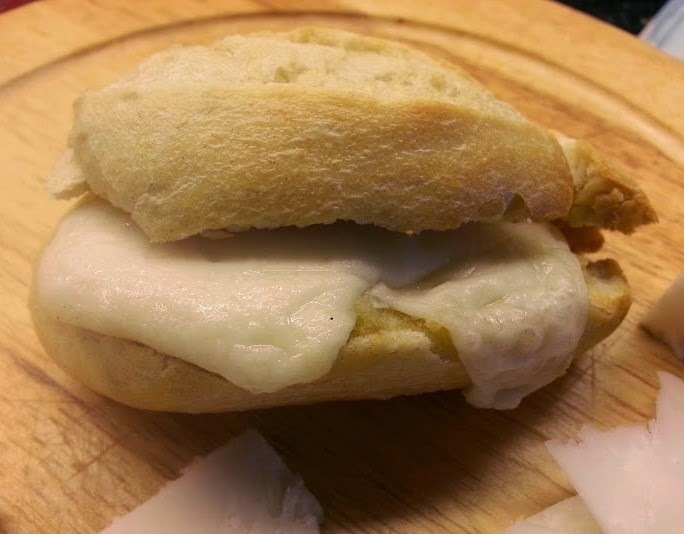 The Goat's Cheese was the next test subject. St. Helen's Farm have 2 different strengths, mild and mature. 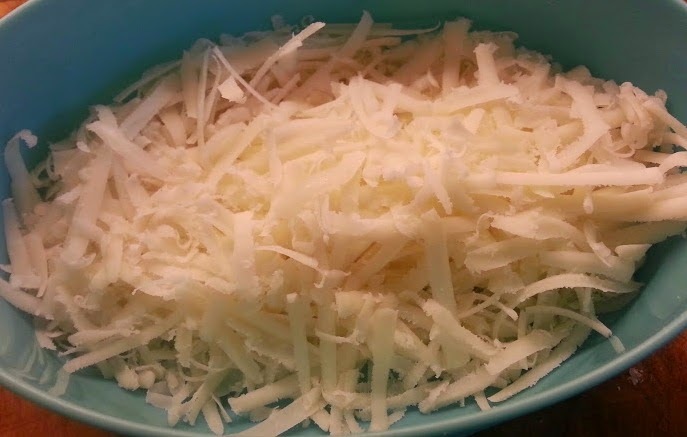 I found this to be gorgeous cheese. 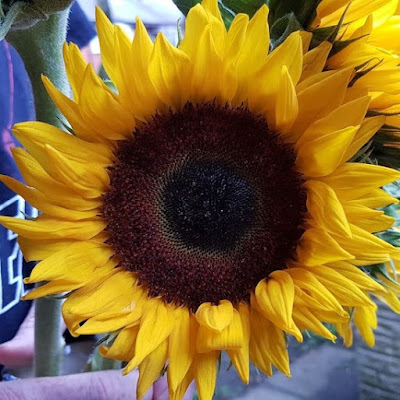 Both varieties were crumbly and not at all rubbery. 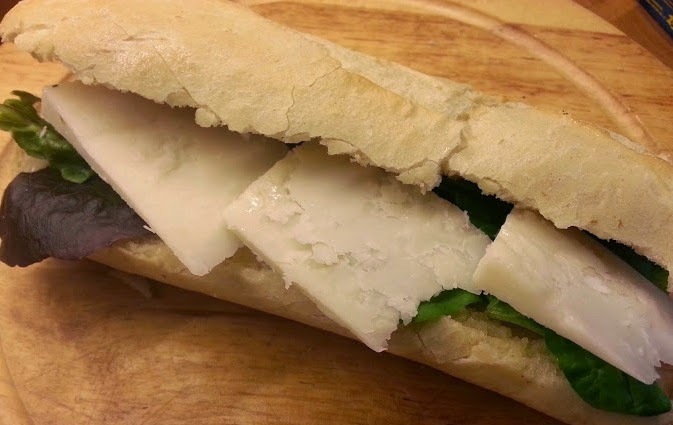 The mature cheese was delicious - beautiful straight from the packet in a sandwich. 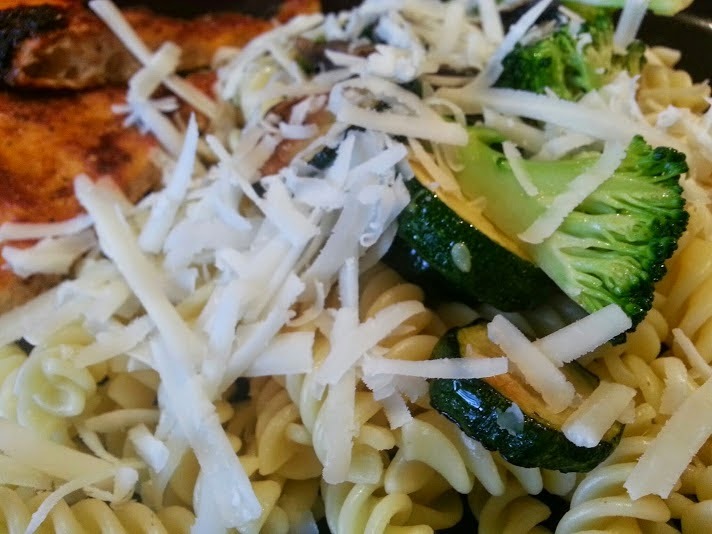 I don't usually like mild cheese but this was lovely, with plenty of mild flavour and a gorgeous texture. 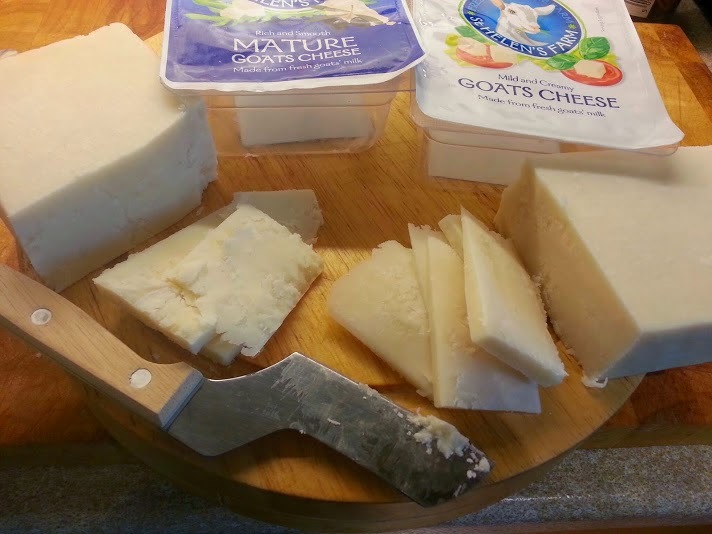 The St. Helen's Farm Goat's Milk Cheese was slightly different to most everyday UK cheeses (a Cheddar for example) when it melted. 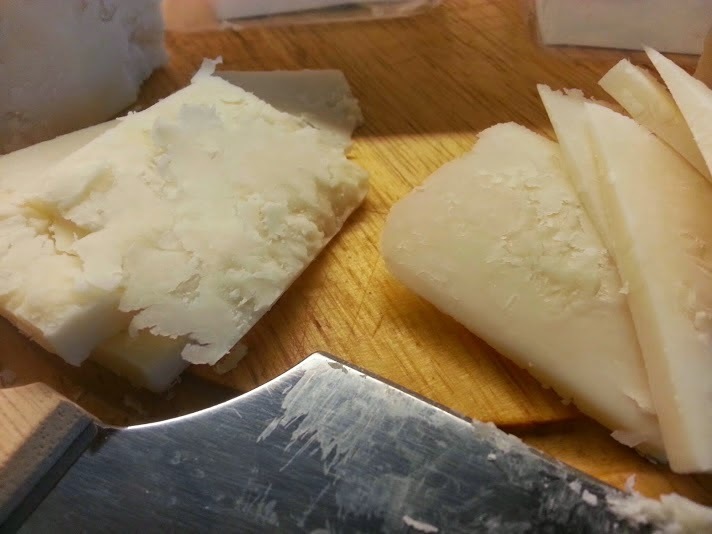 No visible grease or oil, it's a dryer cheese which feels as though it must contain less fat. Everyone was very happy with it, there is no loss of flavour at all. 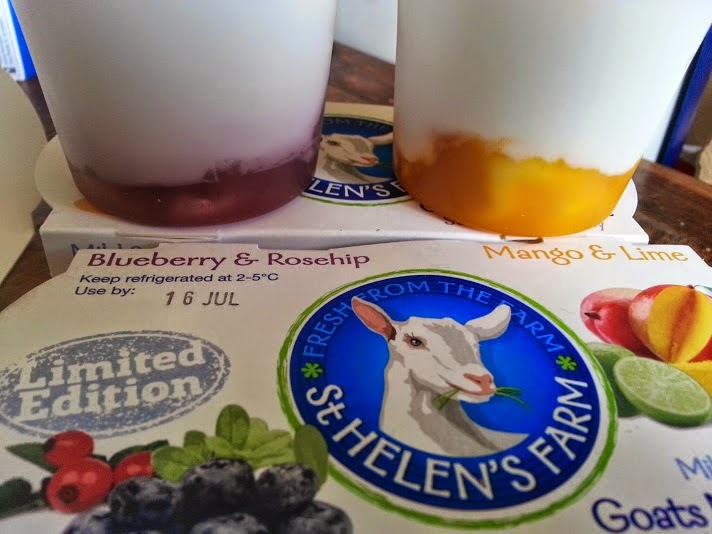 The final products in the St. Helen's Farm Hamper were the flavoured yogurts. Mild & Creamy Goat's Milk Yogurt with a fruit layer was a huge hit. All of my family loved these. The flavours were interesting and exciting, and really well done. Tangy and fresh to compliment the yogurt. Again the yogurt isn't set, so runnier than we're used to, but full of creamy goodness. 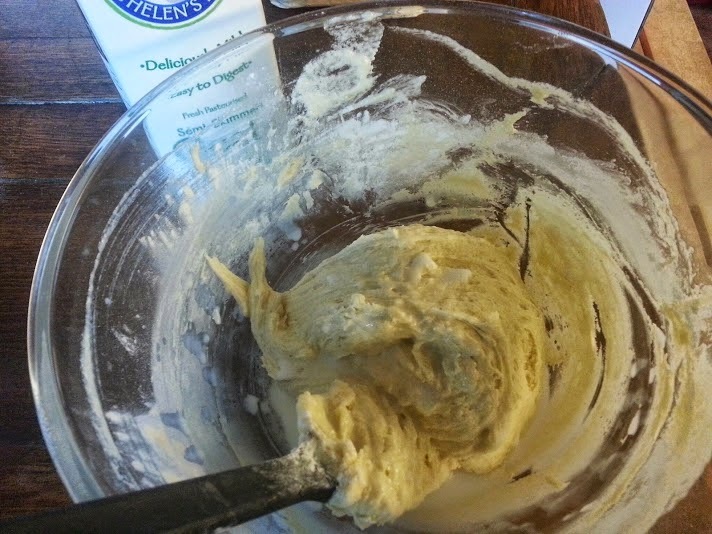 The Blossom Honey Goat's Milk Yogurt is stirred through with honey, and was apparently delicious. All of the products we tasted were creamy and rich, and excellent quality. The yogurts and butter especially were delicious. 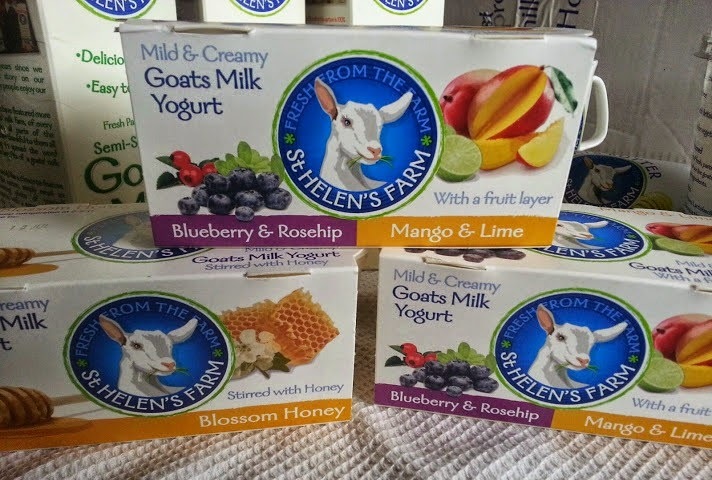 The St. Helen's Farm goats seem well looked after and the company has justifiably won many awards for it's produce at shows around the UK year after year, including 5 Gold Stars at the 2013 Great Taste Awards. We're strong believers in paying farmers a fair wage, and goat farmers hopefully aren't squeezed in the same way as milk farmers because the big supermarkets don't have such a hold over them. This means animal welfare, quality of feed, respect for the environment and employees wages can all be higher. 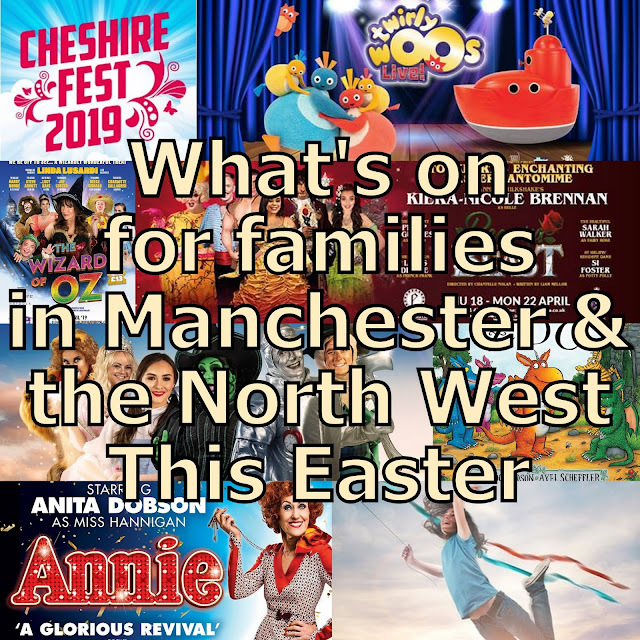 It's an all round good thing. 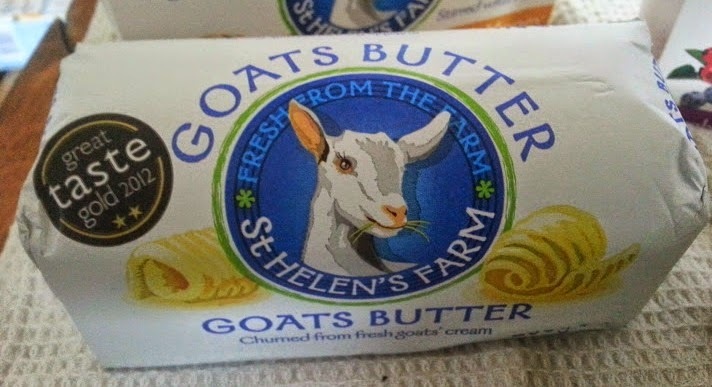 We will definitely be buying St Helen's Farm goats milk products again. 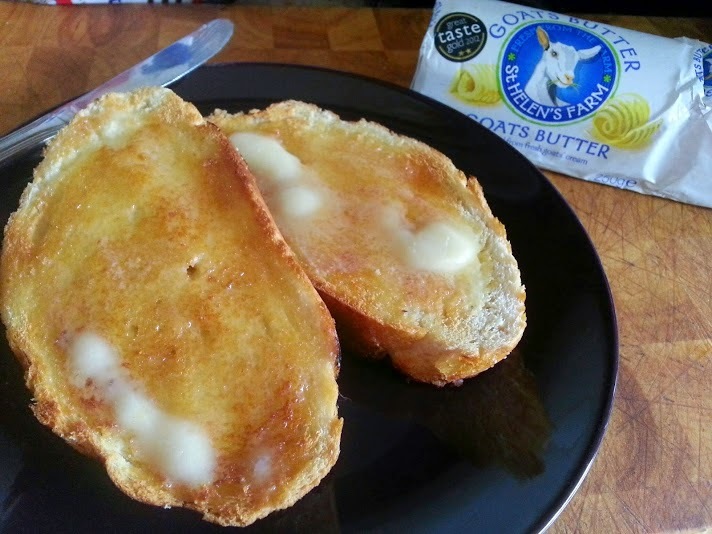 The butter and yogurts really caught our eye and make a delicious treat occasionally. They're available to buy in various supermarkets with current prices varying slightly, but comparable to other premium products of their type. What a fabulous hamper! I love goats cheese but haven't tried anything else. I didn't realise all of the health benefits. Will have to give the yoghurts a try! look lovely! i had not tired goat's products before! not sure if i dare even they sound nice! Don't be scared! It's only the same as cows milk, wexcept the animal is better looked after most of the time! My 500th Post....Meningitis 1 year on. Airbrushing away our children's self-confidence.